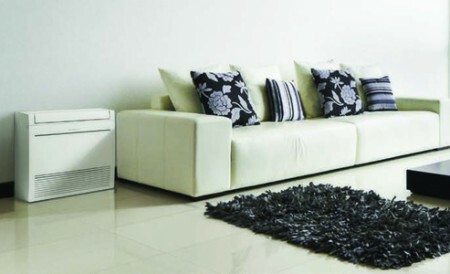 The compact design of the heat pump compliments any home décor. They are a great alternative to bulky and noisy heaters as floor standing units are known to have a quiet mode that produces a sound of only 22 decibels (model dependant), which is softer than a whisper. Floor console units feature dual fan operation that provides the user with complete control over the warm temperature of their room. You can use both fans to heat your room quickly and efficiently. If you only want minimal heat, you can switch off the bottom fan and turn on the top fan only to get that perfect warm temperature. The advanced air filtration system contributes to fresher and cleaner air in your living environment. The deodorisation filter absorbs common household odours such as pungent scents from your kitchen or pets. For more details about the features and benefits of floor standing units, call 0800 125 959. We can also assist you in choosing the right placement of your heat pump in your home or office.